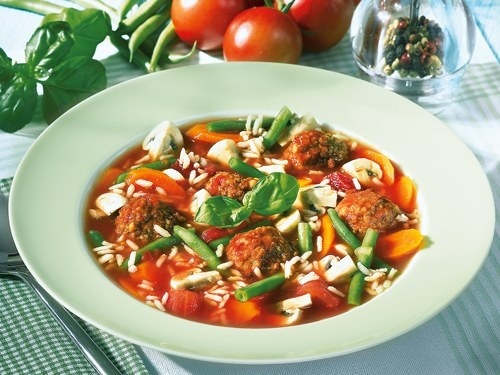 Rice soup with meatballs – tasty and healthy dish that can please the whole family. Cooking will take about one and a half hours, the active cooking time will be approximately half an hour. Beef, pork , onion (half a large onion or 1 small) skip through Mincer 2 times. In forcemeat add salt and black pepper, egg, 1 tablespoon of cold water. Thoroughly mixed, form meatballs 2-3 cm in diameter. Fill a pot with 3.5 liters of water. When the water boils, put in a pot of meatballs. When water again boils, remove the scum, put a Bay leaf. After half an hour add the washed rice, spices, salt. On a heated pan put the butter to melt. The remaining onions finely chop, put on the pan and cook until transparent. After 5 minutes, once the rice soup again boils, add onions to the soup. Cook for another 10 minutes. 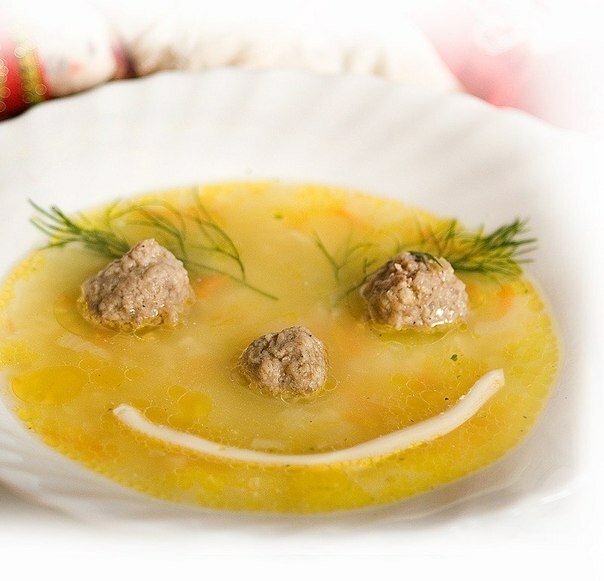 Soup from green peas with rice and meatballs at the same time nourishing and light. Variegated appearance blends perfectly with a rich taste. To prepare this soup is better to use fresh green peas. Rice cover with water in a ratio of 1:2 and cook until tender in salted water. The liquid should be almost completely covered. Garlic finely chop and sauté in oil. Cut meat into small pieces and mix with the egg. From the mass form small meatballs. In a saucepan, pour prepared chicken broth. Bring it to a boil. Add fresh green peas, meatballs, rice and garlic. Boil the soup should be on for 20-30 minutes. Before serving, season the dish with sour cream and dill.